a separate domestic offering of ordinary shares in Egypt (together, the “Combined Offering”). EFG Hermes Promoting & Underwriting and Goldman Sachs International are acting as Joint Global Coordinators and Joint Bookrunners for the Combined Offering. 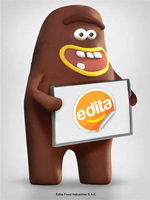 On 27 March 2015, Edita announced the successful conclusion of the book-building process for, and the pricing of, the institutional offering of 92,483,770 of its ordinary shares in the form of ordinary shares to be listed on the EGX and GDRs to be listed on the. An additional 16,320,665 ordinary shares were offered to the public in Egypt in a separate public offering (together with the institutional offering, the “Combined Offering”). No GDRs were, or will be, offered to the public in Egypt. The price for the Combined Offering (the “Offer Price”) has been set at EGP 18.50 per ordinary share and USD 12.28 per GDR (based on the Central Bank of Egypt (“CBE”) EGP:USD auction price as last posted on the CBE’s website on Thursday, 26 March 2015). At the Offer Price, the market capitalization of the Company is EGP 6,710 million (c. USD 891 million). The institutional offering was 13.4x oversubscribed, having generated EGP 22,847 million (c. USD 3,034 million) in demand. Trading in the shares began on 2 April 2015. *The information in this section does not constitute an offer of, or solicitation of an offer to purchase or subscribe for, the securities of Edita Food Industries S.A.E. (the "Company") and there shall not be any sale of securities in the United States, or in any other jurisdiction where such an offer is unlawful prior to its registration or qualification under the laws of such jurisdiction. Likewise, it does not constitute an offer or solicitation of an offer to purchase or subscribe for Company securities to any person who may not by law receive such an offer or solicitation. The Company securities referred to herein have not been and will not be registered under the US Securities Act of 1933 and such securities may not be offered or sold in the United States or to the benefit of US persons (as such term is defined in Regulation S pursuant to the US Securities Act of 1933) absent registration under the US Securities Act of 1933 or such an exemption from registration and the Company does not intend to conduct an offer. None of the information on this website nor any part or copy thereof may be brought or sent in or directly or indirectly distributed in the United States, Australia, Canada or Japan. Failure to observe these restrictions may constitute a violation of Australian, Canadian, Japanese or US securities law. The distribution of this information in other jurisdictions may be restricted by law and persons into whose possession this information comes should inform themselves about, and observe, any such restrictions.